In Radios > Transistor Radios > Show & Tell. Here is a picture of my transistor radio collection. Been collecting 20 years and find the little pocket radios irresistible. The shelf is a home-made from solid oak and measures 48" X 96". What a cool collection and beautifully displayed ! What an amazing collection. I remember them, but had no idea there were so many different models. Ditto for me too . Very cool. And they don't take up as much room as full sized radios. What beauthiful items you got. When i was seven years old i got a Heron transistor that yoy could hang on your shoulder. I have it for many years ago. And i was curious of you got someone between this transistor radios. I have not heard of the Huron but most of these came with a leather case with a shoulder strap. There are many, many different models, this is just a small sample of what is available. We enjoy antique malls and when I see an interesting one that is not over-priced, I'll pick it up and give it a good cleaning and then it is put on display. I have several table top tube radios but as previously mentioned, these do not take up near the room. Yes you are right that radio was in a brown case with earphone i remember. Very nice those were a big part of music in my day. Wonderful collection - thank you so much for sharing it with us! My god this is amazing. I can't imagine how many of these devices I went through growing up - and of course tossed them at yard sales. Transistor radios were the iPhones of the 1950's - incredible technology you could put in your pocket... thousands of people at Dodger Stadium would watch the game while listening to Vin Scully calling the play by play. Beautiful collection, well displayed! 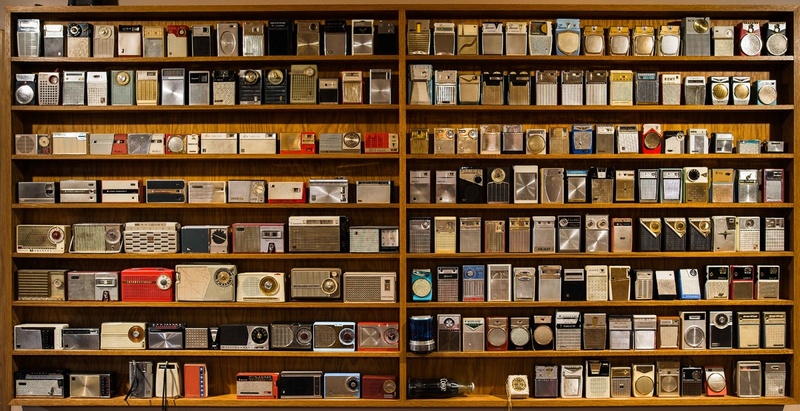 Outstanding collection of transistor radios!! Omg -- I am in Love with this Collection ! !